"Class of 2020, have the confidence to try again and to act independently and responsibly." 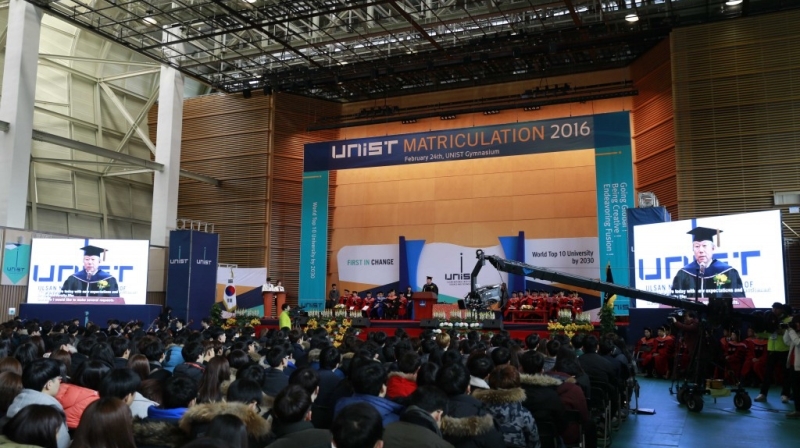 In the morning of February 24th, UNIST held 2016 Matriculation to provide a celebration of student’s academic aspirations and to officially welcome the freshman into the UNIST student community. 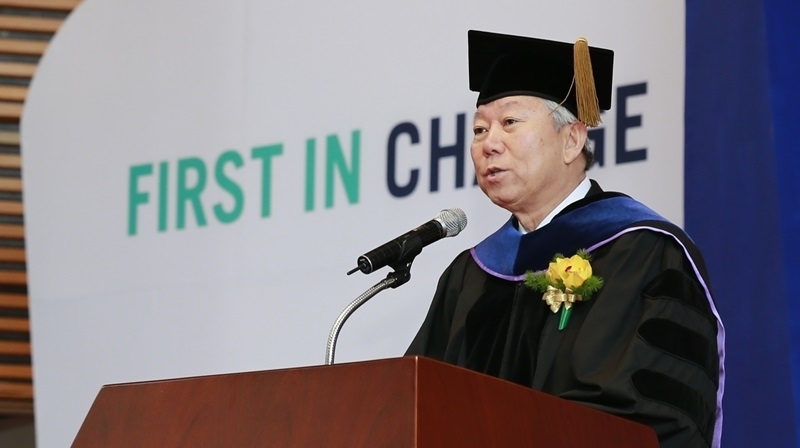 President Mooyoung Jung welcomed the 400 members of the Class of 2020, urging them to have the confidence to try again and to act independently and responsibly, to have a clear goal and vision to push themselves forward, to become a true leader who can manage and take care of others in need, and to be responsible for your actions. I sincerely congratulate you on your admission into UNIST. As today you are being honored here I would also like to give sincere thanks to your parents who raised you to be mature students. 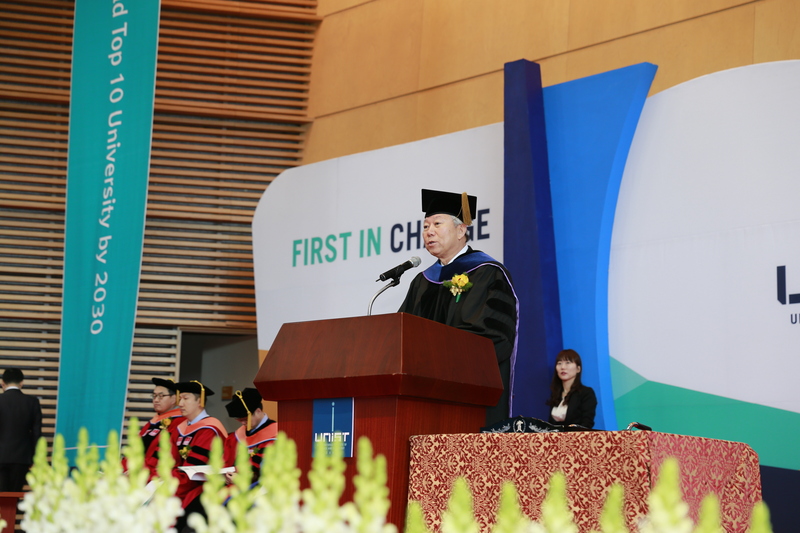 In addition, I want to thank Dr. Lee Hyun Soon, Chairperson of the UNIST Board of Directors and our distinguished guests who are here today to brighten the admission ceremony despite their busy schedules. Today with your lofty ideals and passion you are taking your first step into a bright future in a vast world. For the next four years, your university life will be preparation to change your future dream into a reality. You are individuals with potential and unlimited possibility. How you spend your time here will either make you an outstanding global individual or the opposite. You are all here today with new expectations and excitement for your university life; therefore I would like to make several requests. First, be confident and proud to a UNISTAR. This university was established in 2007 with cutting edge research facilities and education by inviting the world’s greatest scholars, thus rapidly creating results. 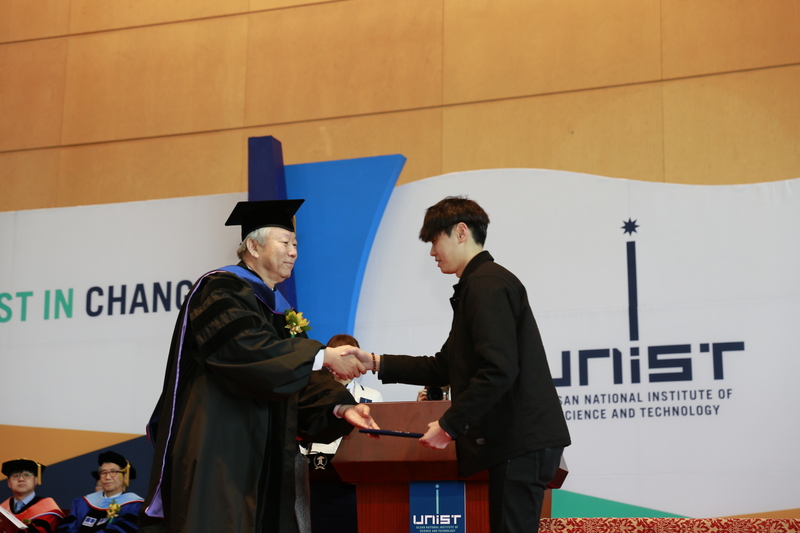 Based on the results, the university has become Ulsan National Institute of Science and Technology, taking a first step into specializing in global science and technology. Being a UNIST student is something to feel proud of. With pride you will be confident to challenge yourself. Second, you need to have a clear goal and vision to push yourself towards. What all the great people in the world have in common are they all had a goal and were persistently devoted to their goal. I hope you utilize UNIST’s resources, such as our personnel and facilities, to hone and refine your skills to achieve your dream and vision. Famous management consultant Peter Drucker once said “The best way to predict the future is to create it”. 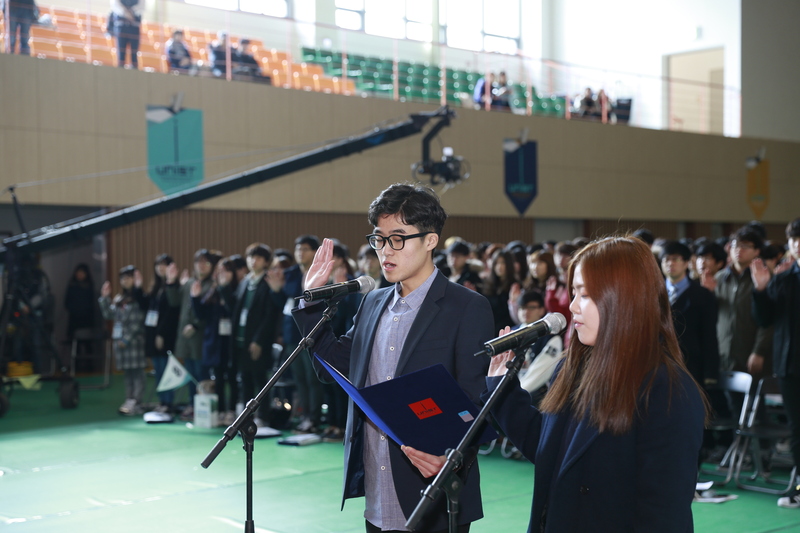 From today, I want you to drop your past baggage and with your clear goal and vision be prepared for university life and start your future. Lastly, to be a global leader, start building your character. An ideal leader for the twenty first century is an individual who can manage and take care of others in need. A true leader is a person that is both valuable to others and humble. Also, you need to be moral and honest. Following law and order and being responsible for one’s actions should be a way of life for UNIST students. To the proud UNIST freshmen! The Twenty first century that represents digital technology and speed is an era of change and innovation. An individual who settles for today and does not change will not be able to lead the new era. If you cannot adapt to the changing new world, your opportunities will be limited. The next four years will be full of fast paced changes. You will need to adapt to these changes and produce results in order to bring your dreams to reality. UNIST will support you, so that you can display your talent and creativity to become the next generation of global leaders. UNIST has nine bridges, so it is also called the Nine Bridge Campus. However, they are nameless yet and will be named after UNIST graduates with great accomplishment and achievements or Nobel Prize winner. I expect one of you today will have your name on a bridge. Again, I want to sincerely congratulate you on your admission to the university.